With a lengthy career in touring and GT3 cars, Theirry Blaise has that sort of confidence and composure that allows him to thread the needle at high speeds. Combine one of France’s fastest tracks and the fastest road-going car produced by Porsche, and that calm at triple-digit speeds becomes quite useful. We’ve seen how the car behaves in a pro’s hands at slow speeds, so here we see how the car is truly better suited to the faster tracks. 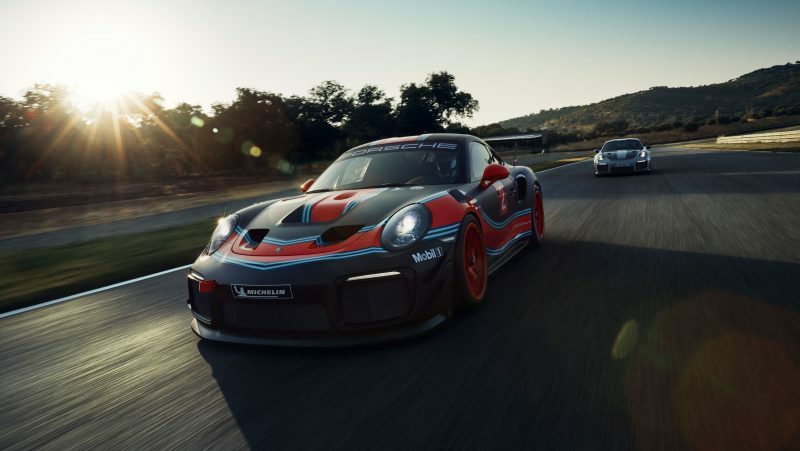 Though the majority of his career was spent in touring cars with half the power of the GT2 RS, endurance racing in a Porsche 991 GT3 Cup surely prepped the Frenchman for the characteristics of its road-going, turbocharged brethren. Changing direction and riding curbs, the GT2 RS shows great stability in Blaise’s hands. Perhaps that’s why Blaise appears so confident and calm while clearly pushing through Magny-Cours long and intimidating bends. With plenty of long, tightening corners, his throttle application is all-important, and a careful deployment of the turbocharged thrust is clear to the keen eye. Under power, it’s surprisingly composed car at high speeds; only mild dabs of opposite lock are noticeable. Where the car does appear a little friskier than some might like is during high-speed braking maneuvers. Note the way Blaise juggles the weight of the sashaying car when hitting the brakes at 0:34. With the grass and the walls so near, and the speed so high, it takes a man as brave as he is coordinated to do that repeatedly. However, it must be predictable and confidence-inspiring to get so near to the white lines with the rear dancing around. That predictability is also evident in the many tightening corners, we get to see how the car tends to understeer gently, even when feeding in the steering with some smoothness. Observing his line through the Turn 12-13 complex, as seen at 1:17, it looks like he’s confident enough in the car to abruptly change direction and ride the curbs. It rewards his bravery, and shows us that, if a driver is comfortable with the rear slithering around under braking, it truly becomes an extension of their body. Porsche 911 E-RWB par Street Fighter LA : Quand RWB rencontre Tesla ! Porsche 550 RS Spyder… Il était temps ! There is a rare breed of driver who can’t quite stand anything that resembles a creature comfort. Even the thinnest carpet offends these serious folks. For those who would skip another meal in the name of another tenth off their best time, Porsche has released a meaner, leaner, even more exclusive version of their fastest RS. For better or worse, this particular model will never wear license plates—this is a track-only special. The GT2 RS Clubsport will be eligible to run at clubsport events, Porsche Club of America (PCA) track days, as well as selected motorsport meets. « For the upcoming years, our customers will not only race the GT2 RS Clubsport during open track days but also at international motor racing events. We are currently holding very productive talks with the race organizer SRO, » says Dr Frank-Steffen Walliser, Vice President Motorsport and GT Cars. Does this mean the return of a customer racing program with turbocharged 911s, à la the 993 GT2? To satisfy the ounce-obsessed road racer who skips carbohydrates three weeks before a track day, any unneeded pounds have been stripped from this svelte track scalpel. The Clubsport ticks the scales at just 3,045 pounds, and benefits from stronger brakes and stickier tires to shorten braking distances to those of a bonafide GT racer. Six-piston aluminium monobloc racing calipers on the front axle in combination with internally ventilated and grooved iron brake discs, with a 390 millimeter diameter provide excellent deceleration values at the front axle. In addition, the rear axle is fitted with four-piston calipers and 380 millimeter discs. Michelin slicks at all four corners provide the sort of grip and traction needed to exploit the thoroughbred chassis on pavement-rippling power. Like the 935, the powerplant has not been modified to provide any more thrust; 700 is more than enough. However, it has been mounted rigidly, as has the transmission. The differential has been optimized to handle the added stress of racing and the increased grip, and the nanny systems—more for speed than safety in this instance—are adjusted via a map switch positioned on the center console. This allows for tweaking of the various systems independent of one another to best suit whatever situation the driver finds themselves in. All that, as well as an air jacks, a fire extinguishing system, and a complete roll cage are just some of the added features which take the GT2 RS, a car which straddles the fence between road car and racer, and clear into the realm of the frighteningly fast and focused track toy for the most discerning enthusiast. Four-piston aluminium monobloc racing brake calipers with anti-knock-back piston springs; multi-piece iron brake discs, internally ventilated with 380 mm diameter, racing brake pads, optimized brake cooling ducts.